Unlikeable college teens with a lack of survival instinct go for a holiday to a remote lake house in the Louisiana swamps. They run into some backwoods rednecks and then take it in turns to get eaten by an assortment of incredibly fast CG sharks. This is predictable stuff, the sharks get little screen time and they don't look right, there's an obvious attempt to wedge in lots of sharks zooming to camera because of the 3D, and the acting is average. 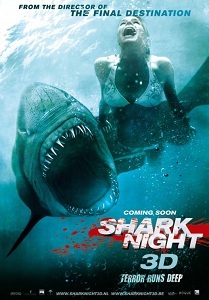 This was probably made on the back of the success that Piranha 3D enjoyed, but it lacks the gore and the sense of humour.